Here are the breeds recognized by the CKC in the Terrier Group. We currently don't have any club members with terriers, but we have provided some examples as well as one of our members handling a Miniature Bull Terrier in Group. Club member Elizabeth Numbers showing Miniature Bull Terrier "Abby" (Jewels Clear Diamond Clarity) in Group at the Credit Valley show in December 2012. 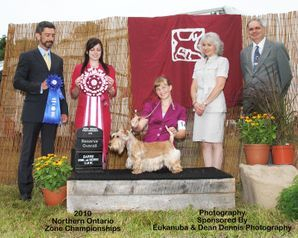 Reserve Overall Junior Handler Kelly Hatt with her wheaten-coloured Scottish Terrier at the Northern Ontario Zone Championships held at the Barrie Kennel Club show in 2010. Best In Show (Aug 5, 2012) Judge: Aida Rivera Franco Smooth Fox Terrier Ch J'Cobe Broxden The Headliner at the Barrie Kennel & Obedience club All-Breed Show.